Salamina Mosese Shares Her Young Daughter’s Sad Encounter At A Restaurant! 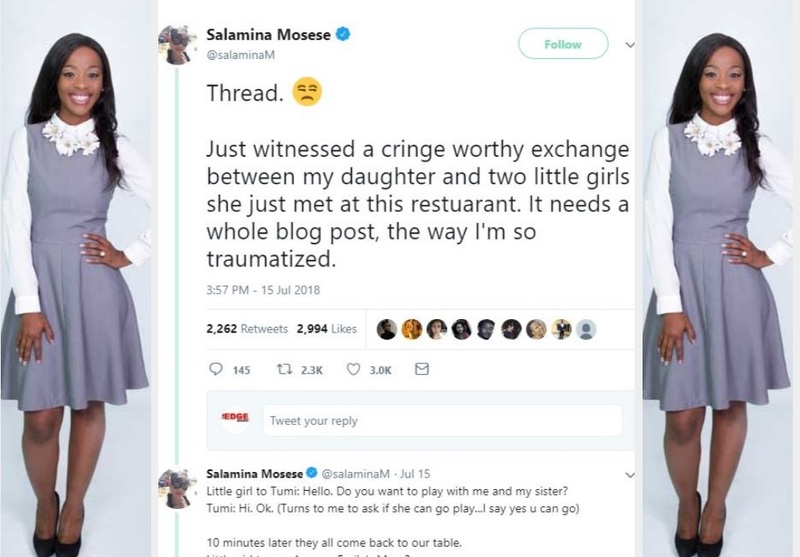 The actress took to Twitter over the weekend sharing a sad experience her daughter had when two other girls couldn’t pronounce her name. Salamina’s daughter’s name is Tumelo and shortened Tumi. The actress shared how whilst eating out, two young girls asked to play with her daughter and when they came back they had a new name for her. Salamina shared how her daughter told her that they had given her the name Emily because they couldn’t say her name, ‘Tumelo’. The actress shared how she spoke to her daughter in an attempt to make it a teaching moment but was left traumatized by the whole encounter.